I thought I would get my hand in with an End of the Month View this time. It's been quite a while, but now the garden is finally to the stage where wide views of the borders make a little sense. So I thought I would join in with Steve at Glebe House Garden. The top photo should look familiar to long-time readers of this blog. This is the South Border, a blend of lavender-purple and soft pinks, home to two large ornamental grasses still in bloom. The dark-leaved Pennisetum setaceum rubrum blooms throughout summer, while the pink haze of Muhlenbergia capillaris "Regal Mist" is much shorter lived, an autumn luxury. The Catharanthus will continue strongly until we actually get cold weather. 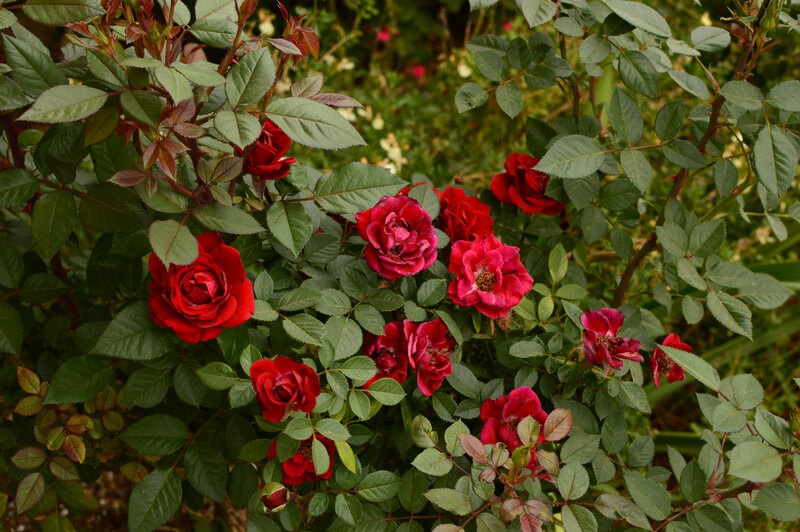 The miniature roses are approaching the size of their full-scale relations! I just posted the East Border in my belated Tuesday View post, so let us walk back up the path and look at the Central Bed. 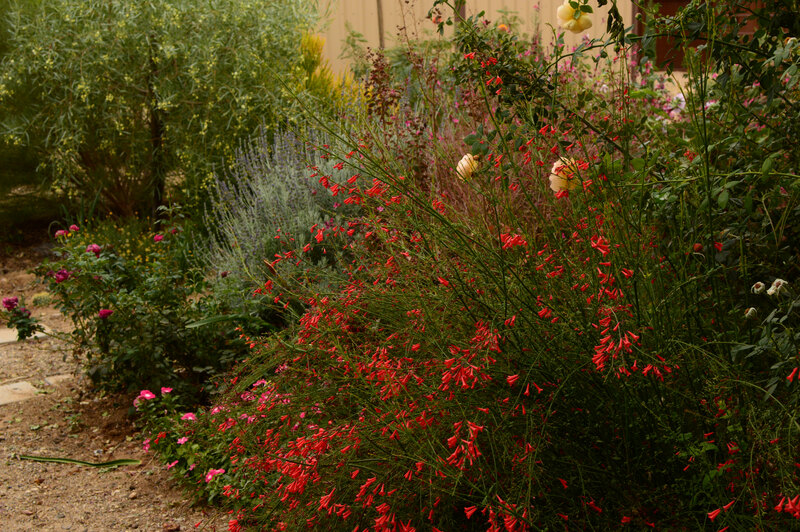 This next photo looks down its south side, where I have planted a mix of pinks and reds. Prominently from this angle there are miniature rose "Daniela" and Gaura (Oenothera lindheimeri noID). Hollyhock "Creme de Cassis" sneaks in an appearance also, though not so much as a couple of weeks ago, when the dog toppled the taller stems. The Alnwick Rose is just visible at the far right. Not to mention the little green patches in the path - what is left from my planting of Myoporum parvifolium, which nearly gave up this summer. As I have no sprinklers, the question of what to do with the paths remains open. I'd prefer to have something green and cool underfoot, but that is difficult to achieve! 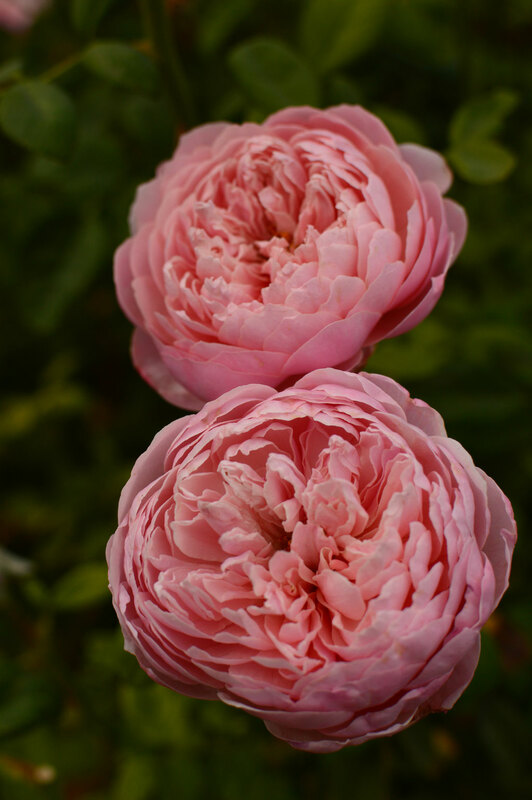 Here is "Daniela", newly in bloom after a hard pruning. Looking down the north side of the Central Bed. This side has even darker, redder plants: Russelia, dark pink Catharanthus (added this year), and rose William Shakespeare 2000. This is looking back up toward the patio. Wollerton Old Hall is prepared to fill the entire archway! Then there is the North Border. I have cleverly chosen my camera angle to avoid showing the massive takeover staged by Justicia californica. Something has got to be done, and I am wavering in favor of wrong-season heavy pruning. Also wondering just how one does prune something that is simply a massive tangle of brittle stems. Other than that, the border is filling in well, considering this was the last section begun. Bright orange-scarlet flowers of Hamelia patens and deep purple-blue of Ruellia brittoniana are the main sources of color this time of year, though rose Mister Lincoln has been putting out the occasional spectacular bloom. Here is a look at the planted (and unplanted!) 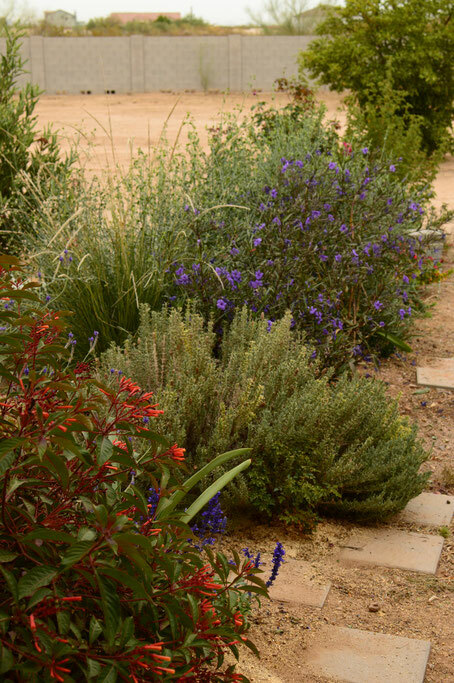 part of the White and Silver Garden: Lavendula dentata, Asclepias subulata, white lantana, Vauquelinia californica, and a few others. Also my beloved Leucophyllum pruinosum "Sierra Bouquet", off in the background with a hefty branch perched on a flower pot to guard it. 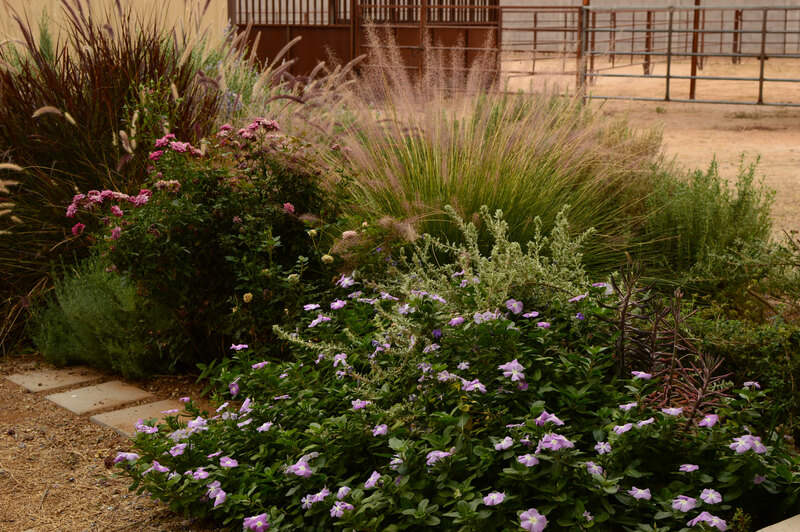 Last week we had a small landscape crew clear the tumbleweed, rabbitbrush, and desert broom that had become unmanageable in other parts of the yard. But that is a separate story! Suffice to say that last spring I came out to find my Leucophyllum with yellow-tinged, weed-killer spray on its leaves, which I hastily washed off. I did not want it dug up this time! I intend to fill in most of the intervening area, though I'll respect the two pathways we've already beaten through it. This is meant to be a wilder area with plants that can survive with very little attention. 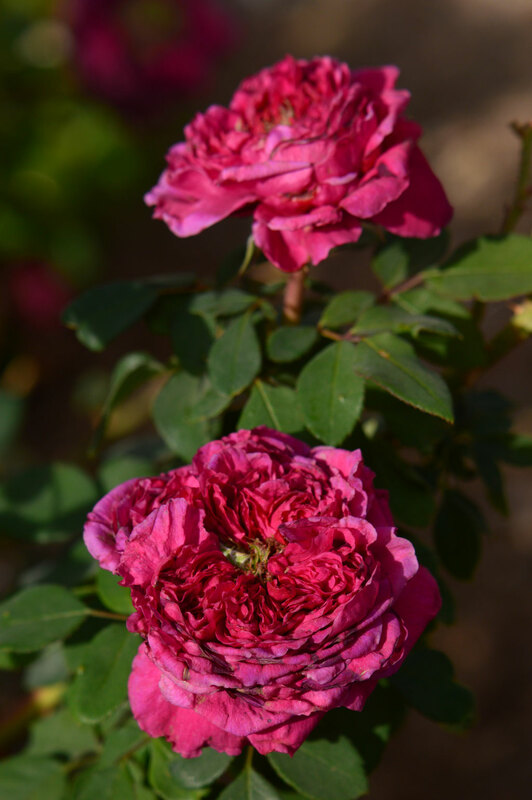 To finish, here are the two roses at the lower corners of the Central Bed: William Shakespeare 2000 and The Alnwick Rose. I do love that combination of the strong dark pink and reds, especially the Russelia, perfect for the harsh desert sun. December here looks somewhat less colourful! Looking lovely! 'Daniela' certainly has a holiday feel to it, your version of a poinsettia perhaps? Perhaps so, Loree! Not that I can resist potting up a poinsettia each year... ;-) But they never make it through summer, where 'Daniela' certainly does! Thanks so much! 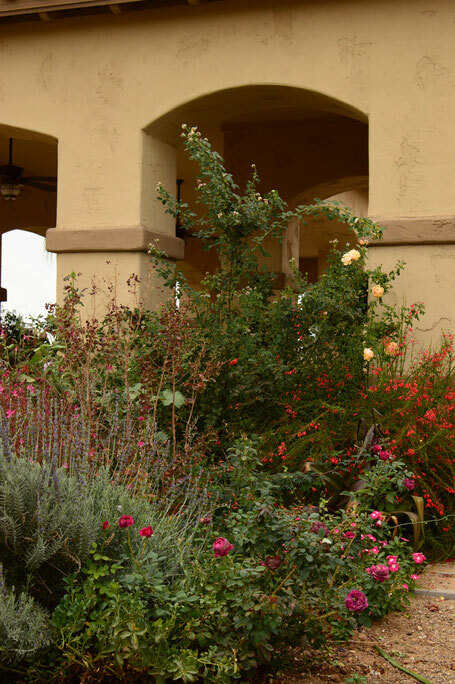 I'm so pleased to see these broader views of your garden, Amy! It's looking fantastic. Your roses never cease to amaze me but the whole composition is beautiful. 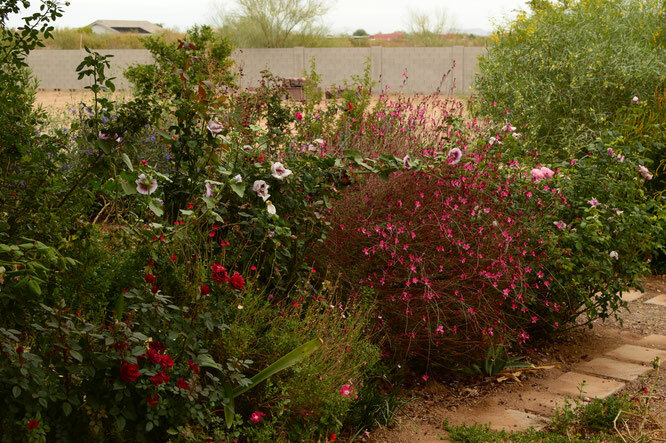 I'd say you've made incredible progress in what I thought was the nearly impossible task of creating an English style garden in the Sonoran Desert. 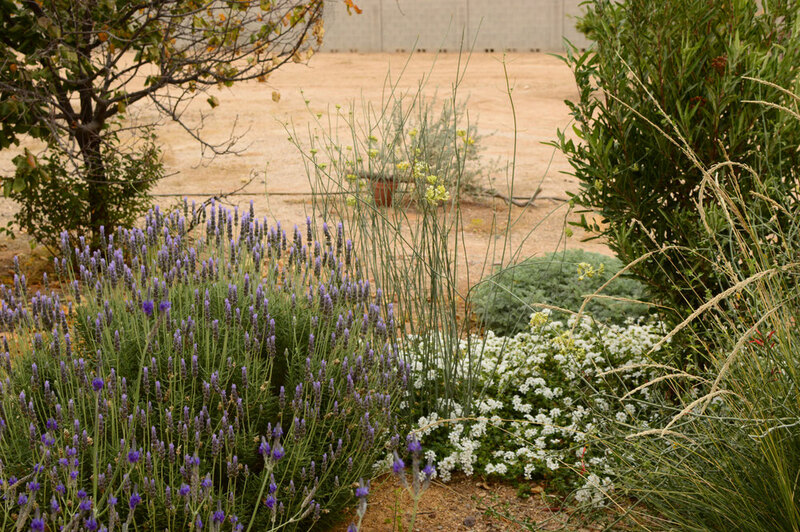 Years ago, I helped a friend with a garden in the Palm Springs area but we never came even close to creating what you have. Congratulations! Your garden has a wonderful amount of colour Amy, especially in the climate you have to cope with. It proves you have the plant knowledge of right plant right place. Lovely to see some wider views of your garden Amy. The Central bed is glorious with all that rich colour, and the silver and white bed is refreshing and calming. I hope you will show us more of it in the future! Thank you very much, Brian! :) There's so much to learn about the plants here...! Thanks very much, Cathy! :) Hopefully the White and Silver garden will figure more as it grows up. It's my main experiment in growing things in the less-tended (e.g. watered!) parts of the yard, so it's an important learning area. Diana - Thank you! It's amazing how little it takes for desert plants to begin looking lush again - mostly just a lowering of temperatures and sunlight! Winter looks so far away, except the cloudy skies. That Shakespeare rose is incredible, along with just about everything else. How long has your M. capillaris 'Regal Mist' bloomed this fall / early winter? David - Winter has been long in coming this year; we're getting nighttime lows in the forties now, but it took many weeks to get to this point! The 'Regal Mist' muhly grass came into bloom in the last week of October, by my records. It is still flowering away, though not as densely now. Perhaps the most beautiful of the grasses... I don't feel it's quite as drought-tolerant as Pennisetum rubrum.